Evernote, for better or worse, is the best note-taking service for my needs. It works across all my devices/computers/modes. It's fairly easy to get stuff into it. Hell, they even have 2-Factor authentication. The Windows app is a little clunky and my girlfriend and I have never been able to get shared notes to work properly (conflicted note! three times in the same grocery trip! ), but what service is perfect? At least they have nice socks. Everything, in fact, is pretty good as long as you don't screw up. And screw up I did. I'm not very regular about making backups, but I do make them every month or so. Once you figure out how to create a backup, that is. There's a helpful Export Note option (which turns into Export Notes when you select multiple notes HINT). The export process is essentially opening All Notes, selecting every note, and then choosing Export Notes. 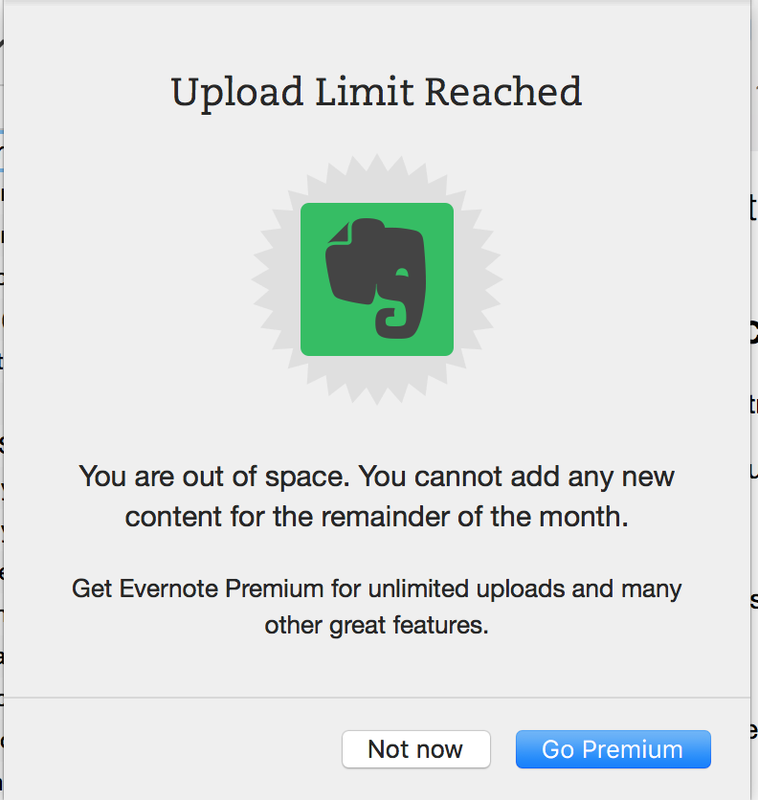 Or something like that; Evernote never tells you, you're left to figure it out on your own. The file the process makes includes all the notes, tags, and media, but not your notebooks or stacks. This becomes important if and when you need to restore. Why? Because what you've now done is create one, huge file with every note in your account but with no information about how those notes were organized. It's a fast and easy and repeatable way to dump data out, but not what you may want on the import side if you're restoring. 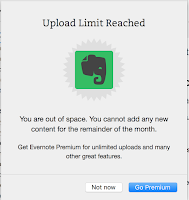 So, what have I done to myself that Evernote didn't anticipate? I divorced my work and personal life. I'd had 2 stacks, one for my personal notes and one for work notes. After a few weeks trying to make OneNote work, I decided I'd just go back to Evernote (at least until they go under) for everything. So, that's an Import, right? But it's an import of that huge, single file you made a few weeks/months ago. Everything. There is no way to intake only a portion of a backup. You can't selectively import notes, notebooks, or tags. You also do not get back any of the structure your notes had at the time you made the backup. Imagine if you backed up every file on your computer, but when you restored them, they all came back at the same, root level with no indication of the folder they used to live in. And you have to take them all, whether you have them on that computer or not. That's an Import in Evernote. You cannot cancel an Import once it starts. Have thousands of notes? Get ready to wait it out. Every note on and before your last backup is now a duplicate. Every imported note is in a new notebook, not the notebook it came from. This is not true. It will be true if you try to sync, but if you quickly delete everything before the sync starts, it isn't true. But you did get pitched the upgrade, so that's nice. The modified date of imported notes is the day of your import, not the day the note was actually modified. This make sense from one perspective, but from a restoration perspective I didn't modify the note when the restoration happened, but when I last edited the note. This a) saves you when you figure it out because you can quickly delete duplicate notes made today but b) means Evernote can't tell if the note being imported is a duplicate of an existing note. There's really no good way back from this point. Even if I upgrade, I can't sort notes back into their original notebooks with an import and manually sorting 3700+ notes.. yeah, not going to happen. So, I suppose I cut my losses and copy in relevant work notes and leave old notes in OneNote. Exports should include the notebook name at minimum, probably should include the stack name as well. These items should be restorable. The ability to specify a date range to restore. Duplicate note checking. GUIDs should be part of a backup. The ability to cancel an in-progress import. A more accurate warning when you are about to exceed your monthly allotment. And finally, something that Evernote apparently used to do: ask if the newly imported notebook should be synced. I did not see this option on my import. At least I've learned something. Hopefully others can learn from my mistakes.